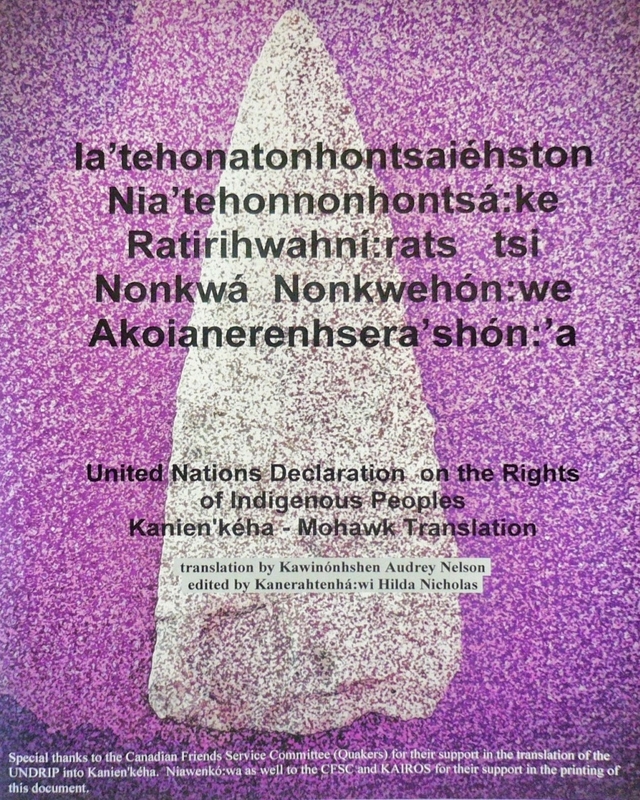 The UN Declaration on the Rights of Indigenous Peoples was translated into Kanien’kehá:ka (Mohawk) by the Mohawk Language Custodians Association of Kanehsatà:ke with financial support from CFSC. Editor’s note: Over a year ago CFSC reached out to several of our long-term Indigenous partners, asking them for guidance and support as we considered the rightness of operating a Reconciliation Fund. We set up a working group with some of these Indigenous partners, who agreed to review applications to the Fund. Based on the working group’s advice, the focus of the Fund is cultural preservation and restoration projects. Last summer, the working group helped us choose the first grant recipient, the Kontinonhstats – Mohawk Language Custodians Association (MLCA). The MLCA used funds received from CFSC to conduct research and develop curriculum for Kanein’kéha language classes and cultural content. I support the Reconciliation Fund out of a sense of responsibility, accountability, and obligation. As I have learned more about the failure of my settler predecessors to honour their treaty obligations, and about the damage of the residential school system, I’ve developed some appreciation of the past and continuing injustices that carry forward for both the Indigenous and settler descendants who call Canada home. We need to invest in healing and reconciliation – now. I am a beneficiary of broken treaties. I did not “do” it, but I have a responsibility to recognize and accept that I have benefited from these injustices. And then I have an obligation to do something about it. What I am doing is making an ongoing commitment to support the Reconciliation Fund. Part of my Canada Day celebration is to haul out my previous year’s income tax and do a 2% assessment on line 236 – Net Income. Then I go to the CFSC website and do an electronic transfer of that amount, designated for the Reconciliation Fund. Is this the right percentage to use? I don’t know, but it is calculated on a figure that I feel represents some of my benefit as a member of the settler community. And I do not consider it part of my “charitable donations.” This is not “charity,” this is accountability. I am seeking to make amends for the damage of the past and investing in healing for the future. I do not reduce my charitable donations to CFSC or other worthwhile organizations by this amount. I also realize that I need to support the work of reconciliation with more than money to the CFSC Reconciliation Fund. I need to spend time learning about the history of settler and Indigenous interactions – both the tragic and mutually beneficial ones. I need to increase my awareness of hopeful initiatives that are leading to healing and reconciliation. And I need to act to support those initiatives as an individual and in my community. We have much to heal. We have much to learn. A Canada that incorporates Indigenous wisdom of how to treat mother earth, how to deal with relationships out of balance and to value each member of the community, will be a stronger and more vibrant country. We need our governments to do more than offer lip service to reconciliation. While we urge them to do so, we can demonstrate our willingness by making our own contribution to reconciliation through supporting the Reconciliation Fund. This year, when I file my income tax, I will also send a letter to the Prime Minister and appropriate Ministers of the Crown explaining my contribution to reconciliation and encouraging them to do more. I invite you to include making a contribution to CFSC’s Reconciliation Fund in your Canada Day celebrations. I find it helps me feel more “in right relationship” with the celebration. Tony McQuail is a semi-retired farmer living near Lucknow, Ontario and a member of Kitchener Area Monthly Meeting active in the Lucknow Worship Group. You can donate by writing “Reconciliation Fund” on your cheque’s memo line, or choosing “Reconciliation Fund” from the drop-down menu titled “My donation is for” when donating online (https://quakerservice.ca/support).